With their black back and head, and white front, Adélie penguins are like miniature men in evening dress. They are named after the wife of Dumont d’Urville, the French Antarctic explorer. Adélies are truly Antarctic penguins, restricted to Antarctic coastal waters. 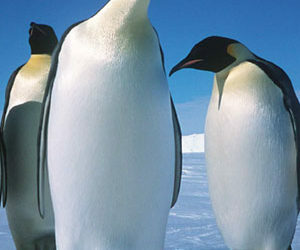 During winter they spend their time in the pack ice, then in the summer they move south, back to the Antarctic coast. Closely packed Adélie rookeries of many thousands of pairs are found all around the Antarctic continent, on ice-free slopes and islands, often far from open water. Fishing mainly for krill, they can dive up to 175 metres, but mainly catch their food at the surface. They experience the briefest of breeding seasons in the harshest conditions. The males arrive at the breeding ground first, walking many miles over sea-ice. When the females arrive a few days later, a brief courtship of flipper-waving and calling follows. But they must hurry: with such short summers, they don’t have much time. Two eggs are laid in mid-November, tended by both parents, that hatch in late December. The chicks join a crèche at three weeks, and by mid-February they are at sea. Adélies are very vulnerable until they reach the crèche stage, and less than two-thirds of them make it this far. Once at sea they are fairly safe, and can live more than 16 years. 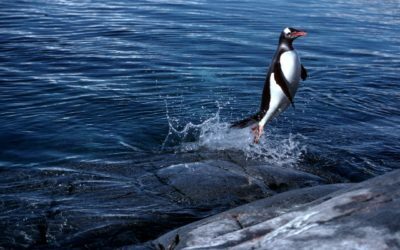 Though they have the highest mortality for juveniles and adults of any penguins species, they are a successful species, with two and a half million pairs. Though only small, Adélies are penguins with attitude, and will rush out of a colony to attack a visiting scientist with their flippers.